Date night. The 1:1 uninterrupted dinner that eludes most parents with wee ones at home. For many it becomes pizza delivery and a streamed movie after the kids are in bed. Perhaps you’re resolved to schedule some dedicated date nights in 2013? Once you secure the date and babysitter, you’ll likely want to make the rare night out memorable and hassle-free. These are some of the best apps to help you plan your next date night. 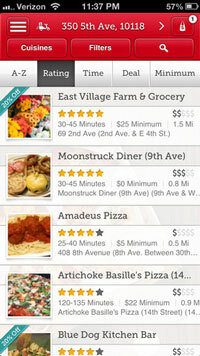 If you’re a foodie at heart, this is one of the more exciting food apps we’ve used lately. Chefs Feed shares favorite dishes at restaurants across the country from the experts themselves – well known chefs like Mario Batali, or chefs you will want to know like Gabriel Thompson of L’Artusi. Get their thoughts on their favorite delicious dishes when they eat out – dishes that aren’t even from their own kitchen. You can discover a broad range of amazing food and places where you can eat like them – everywhere from food trucks to fine dining. 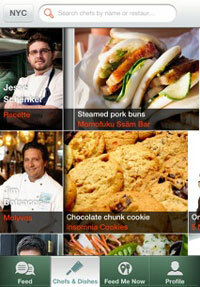 Chefs Feed is currently available in 16 major metropolitan cities. With more than 26,000 restaurants nationwide, Open Table is one of the most convenient ways to make a reservation, and has become a must-have app for all of our devices. You can even add special requests to your reservation in the comment section when you book. There’s no fee to use OpenTable. In fact, with each reservation you earn Dining Rewards Points that will get you free meals when you hit certain point levels. Perhaps you’re planning a fun or romantic night in? Don’t want to spend your night with the kids over at your in-laws cooking? If you live in the New York Tri-State Area or one of nine other major metropolitan areas then you know Seamless is the place to go for ordering quick takeout or have fine dining delivered. There’s over 11,000 restaurants to choose from that will serve a broad range of taste bud needs. 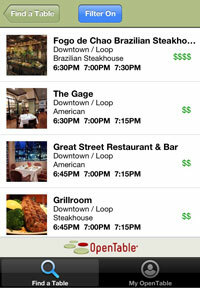 If you’re looking for something to do either before or after your date, then check out the Poynt app for some ideas. This app can provide you with things to do around your current location, including nearby events (you can set the date range of what to show), movie theaters and showtimes, even restaurants. Search also lets you find businesses near you. 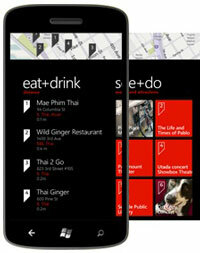 Exclusive to Windows Phone 7 & 8 devices, Local Scout enables you to find everything from places to eat and drink, to local places of interest. You can find it under the “See and Do” category, a section devoted to shopping. You can get personalized suggestions based on you past search behavior on Bing or connect your Facebook account and get ideas based on your friends’ check-ins and likes in your local area. 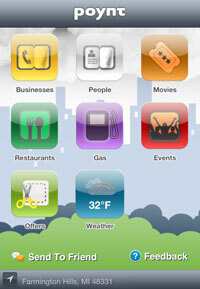 We use it to find places to schedule coffee meetings around New York, or split dessert after an evening soiree. Price: Free on Windows 7 & 8 OS, just press the search button, then tap Scout.